The call for official recognition of First Nations languages was made by Perry Bellegard, national chief of the Assembly of First Nations, at the organization's annual general meeting earlier this week. Bellegard called on the federal government to invest in promoting, protecting and enhancing the country's Aboriginal languages so that they won't die out. Onowa McIvor, director of Indigenous education at the University of Victoria, says the proposal has been made by First Nations leaders multiple times over the past few decades, but little has been done. 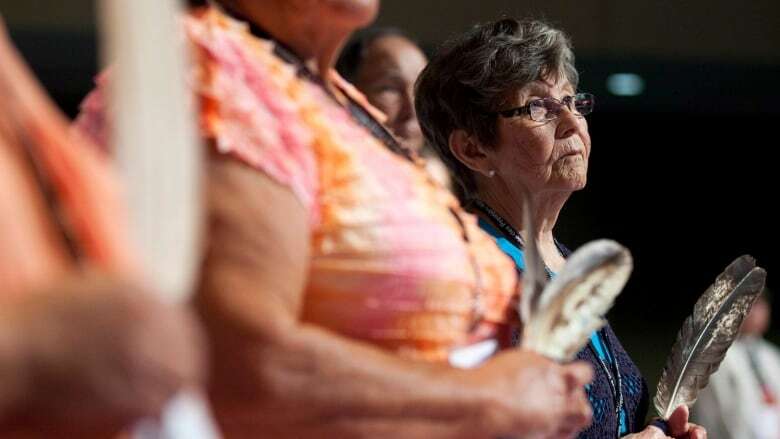 McIvor says it's high time the federal government take action, following the release of the Truth and Reconciliation Commission's report, which recommended the federal government be responsible for language preservation. "The government of the day, I'm not sure if there's much appetite there, but the Canadian public really are the people who should be concerned about this," McIvor told All Points West. "These are their heritage languages as well, the original languages of this country, and I think we should all be concerned that they're not already official languages." There are roughly 60 different Indigenous languages spoken in Canada, and more than half of them are spoken in British Columbia, McIvor says. Still, she says it's possible to have them all officially recognized nationally, but implemented at a regional level. "It just doesn't make sense to do it any other way," she said. "There's such diversity across the country."